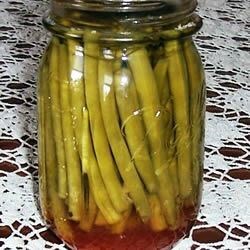 "Spicy pickled green beans made the old fashioned way. This was my Grandmother's recipe, I hope you enjoy!" Contact your local university or county extension for proper processing times and safety precautions for canning in your area. Identical to my father's recipe- If you like pickled vegetables, this one is sure to please! I did not use the musturd seed this recipe calls for since the pickling spice I used had lots already. Husband LOVED!!! Thanks! !